Community health worker Eudeli Velasquez at her husband's family home in Reforma, Mexico. It’s not yet noon in Reforma, Chiapas, and the sun sizzles the empty dirt roads crisscrossing this small rural town in the Sierra Madre mountains. Those who venture outside walk slowly and stay within the shadows cast by overhanging corrugated metal rooves. Men wear wide-brimmed hats and women carry umbrellas to create personal bubbles of shade. Eudeli Velasquez, 23, stops by the Reforma health clinic and lingers in the cool of the awning. She’s there to see Dr. Gerardo Murillo, a first-year doctor fulfilling his social service year through Compaňeros En Salud, as Partners In Health is known in Mexico. She asks for something to treat headaches, and he ducks into the pharmacy. Seconds later, he comes back with a package. Velasquez doesn’t need the pills; one of her patients does. As a PIH community health worker, she makes weekly visits to six residents living with chronic diseases—such as hypertension, diabetes, and depression—to ensure they take their medication and follow doctor’s orders. Most importantly, though, she’s there to listen to their concerns, answer questions, and keep them company on days that feel heavier than they should. Popping open a yellow floral umbrella, Velasquez steps back into the sun and, a couple of turns later, stands in front of a red metal door with a grated window. Her round face is flushed from the short trek. Juana García answers Velasquez’s knock. She sells children’s clothing and other goods from her small store, which seems closed today—possibly because of the owner’s pounding headache. She suffers from hypertension, and Velasquez has been visiting her for the past six months. She briefly greets the community health worker and retreats into the dark store with the medication. Velasquez next stops by the home of Maria Roman, a 60-year-old woman who is Reforma’s last remaining midwife. Today, like most days, Roman is sitting in a plastic chair on her shaded back porch, watching her chickens peck the bare, immaculately swept dirt yard. She has hypertension and diabetes, so her feet swell and make it painful to stand and walk. She hasn’t attended a birth in ages. Then again, demand isn’t the same as it used to be. Most women now prefer giving birth at the hospital in Jaltenango, a city 45 minutes away by car. 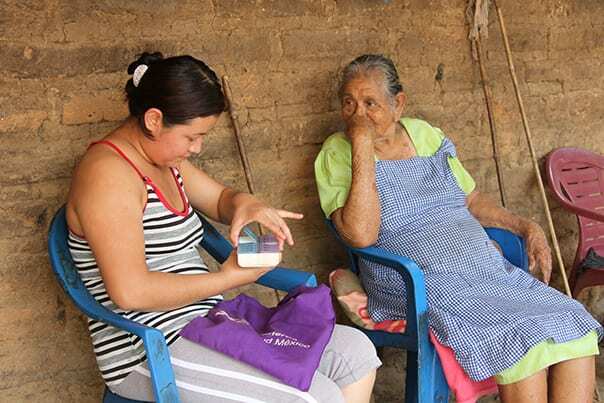 Velasquez visits Maria Roman, who suffers from hypertension and diabetes, to ensure she's taking her medication. A family member comes with a pillbox and hands it to Velasquez. She opens the square plastic lids for each day, counting pills to confirm Roman is truly taking her medication. Her patient used to get pills from a pharmacy outside Reforma and refused to take those from the local clinic, claiming they were bad for her. Velasquez told Dr. Jesus Rocha, the PIH-supported doctor working there at the time, and both made a home visit to explain that they were the same pills. Velasquez turns onto the road where she now lives with her in-laws. Instead of stopping home, she goes to the next house down to visit another patient. She walks through the dark living room to the shaded patio, where Rosemberg Lopez, 52, swings placidly in a hammock. He flashes a childlike smile as his community health worker takes a seat beside him to review his medication. Lopez lives with schizophrenia and, since Velasquez became his community health worker, has been stable on medication for the past two years. His mother, Erminia Borralles, is a petite, gray-haired woman who unconsciously wrings her hands as she retells the horrors they lived through during his illness. Her son, she says, started acting strangely around the time he turned 18. He used to hit them, throw food, and hurl rocks at children. Occasionally he walked through town naked. He disappeared for days into the surrounding hillside. Then he arrived one day at the elementary school with a machete and started chopping away at desks. Teachers eventually detained him, walked him home, and had him chained to a tree. Ashamed and beside themselves with worry, his family took him to traditional healers and several doctors throughout Chiapas, eventually learning he suffered from schizophrenia. Although medication worked for a while, it was expensive and wasn’t available in the Reforma clinic. His family had to make a tough choice: buy food, or keep Lopez medicated. When his drugs ran out and he relapsed, they locked him in a windowless shack behind their home. And that’s where he lived for six years. She got part of her wish, only not how she’d planned. When PIH announced it was recruiting community health workers in 2014, Velasquez was among the 40 residents who showed up for more information and was one of the nine women finally selected. She and her colleagues attended three months of training on everything from how to complete forms to how to identify symptoms of depression. Each was then assigned up to eight patients diagnosed with chronic illnesses. Velasquez requested Rosemberg as one of her patients. PIH staff greatly credit her for his early and consistent adherence to medication. He now eats, sleeps, and hangs out with his family. The chains that used to shackle him to a tree lie rusting beside the vacant shack. There’s been another slow change that’s possibly less obvious, but equally important. Velasquez remembers when she and her colleagues started making rounds in Reforma and word spread that “women shouldn’t be walking around working.” The rest of the sentence was implied: “…outside the home.” Traditionally, women cook, clean, and take care of the kids. They don’t have to, or can’t, leave the house. In-laws and neighbors ensure any violation of that norm is passed along to spouses, who may disapprove in unsettling ways. With the launch of the community health worker program, expectations started changing. The nine women are on official business—visiting patients, reporting to the clinic, and attending PIH-sponsored trainings—and earning food for their families. The role shift is radical. Revolutionary. And sometimes envied. Velasquez says women ask her if PIH is recruiting more community health workers and wonder if she will “put in a good word” for them. She laughs. They were too “shy” before, now they want in too. Velasquez picks up her 6-year-old daughter, Devani Dean, from school on a day students made sock puppets. 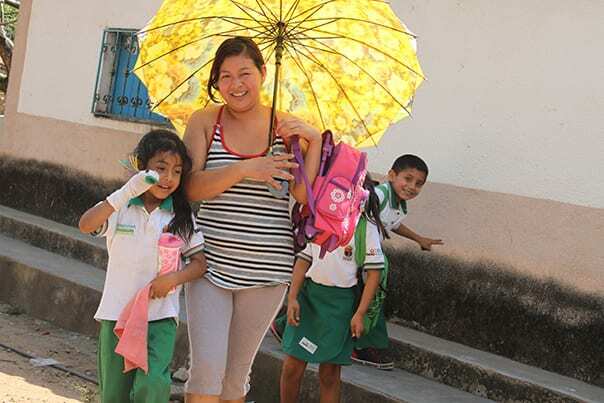 It’s early afternoon and Velasquez pops open her umbrella once again to fetch her 6-year-old daughter, Devani, from school. The pony-tailed girl proudly shows a new sock puppet to her mother, who slings her daughter’s pink backpack over her shoulder. They return home, where Devani quickly changes out of her school uniform and skips out the door to play. Velasquez mops the floor and tidies up her bedroom, the sole place she has to herself in her in-laws’ home. A TV perches on a table opposite her double bed and broadcasts a show she largely ignores. She can’t control which channel is on; her in-laws make that choice on the linked TV in the nearby living room. A couple hours later, Velasquez gathers up six slips of white paper, one for each of her patients, and walks back to the clinic. On the first Monday of every month, she sits down with Murillo to review her patients’ progress. Together they troubleshoot particularly difficult cases. The sun finally melts west toward the surrounding mountains. Velasquez leaves the clinic and turns back uphill, choosing a path in the deepening shadows cast by now-shuttered stores.